You may know that you can use scripting in Whitebox Geospatial Analysis Tools to automate your workflows, but did you know that you can also use the same in-application scripting to develop your own custom plugin tool? Of course, you can develop a custom tool using the Java programming language in an integrated development environment like Netbeans (see the How to create a plugin tool for Whitebox tutorial in the Help) but that is a bit of an involved process. By far, the easiest and most rapid way to create a new tool is to use Whitebox’s scripting functionality. 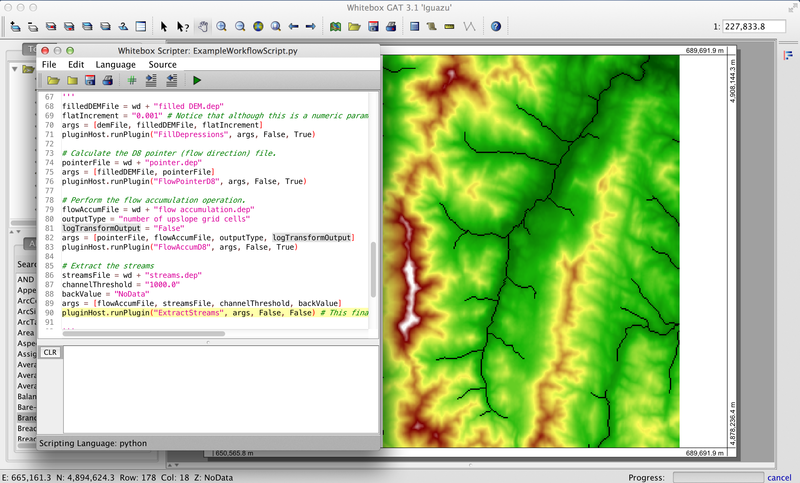 You can write script-based tools to do any sort of spatial analysis function including manipulating raster data, shapefiles, and even LAS LiDAR point clouds. The best part of developing a script-based tool is that because you don’t need to recompile the program and add the jar file into the appropriate directory every time you make a change to the code, testing your tool on real-life data directly in the Whitebox environment speeds up the testing phase of development considerably. Have you ever noticed that the tools listed in the Tools panel have two different icons–the ‘wrench’ ( ) and the ‘scroll’ ( ) icons? The ‘scroll’ icon designates a tool that is written as a script using the Whitebox Scripter. Importantly, when you develop a tool using the built-in scripting functionality, Whitebox will treat it in exactly the same way that it treats compiled Java tools. This means that it will be listed in the Tool treeview and listings, it will have the same type of dialog user-interface, and it will even be automatically available to be called from other scripts. There are more than one hundred standard plugin tools distributed with Whitebox that have been developed using scripting. People frequently ask me how I’ve managed to write so many GIS tools into Whitebox (over 400 at this point) and script-based tools are my secret advantage. One of the major differences between these tools and the compiled Java tools, is that they are fully editable. That is, you can open a live version of the source code of scripted tools directly in Whitebox and modify the code and the changes will be integrated as soon as you save the file. You simply need to right-click over the tool in the Tool treeview and select Edit Script. Having the ability to dig deep into the functionality of a tool and even experiment with the code is a large part of the open-access development strategy that the Whitebox project has developed. And the user doesn’t have to worry about breaking the code, because you can always fix any changes that you make to the code by reverting to the original version simply by right-clicking over the tool’s icon and selecting Update Script From Code Repository or by selecting Update Scripts From Repository in the Tools menu (this will also give you a preview of any new scripts that have been committed to the repository after the release version that you are using). So feel free to mess around with the code for various tools. Experiment, tweak, investigate, improve, and have fun with it! script to be integrated into the tool tree panel. 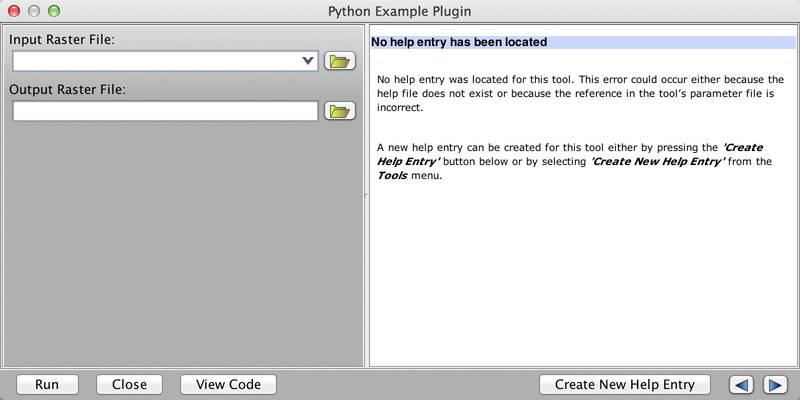 descriptiveName = "Example Python Plugin"
description = "Just an example of a plugin tool using Python." It has two input parameters, an input raster file name and the name of the output raster. To do this up right, we could write a help file for the tool and make sure that it is saved in the Whitebox Help directory. To do this, you simply need to select the Create New Help Entry button on the dialog and enter the HTML document. // description and toolboxes must be present. // class, with an html extension. // button on the tool dialog to be displayed. // script to be integrated into the tool tree panel. // Comment them out if you want to remove the script. def descriptiveName = "Example Groovy tool"
def description = "Just an example of a plugin tool using Groovy." def scriptFile = pluginHost.getResourcesDirectory() + "plugins" + File.separator + "Scripts" + File.separator + name + ".groovy"
Of course, if you develop a custom Whitebox plugin tool that you think might be useful for others, then consider donating your tool to the project so that it can be distributed to the whole community. To do so, simply e-mail me your source code and perhaps some data to perform testing on. Leave your comments below and, as always, best wishes and happy plugin tool writing!